Always say "Thank You", that's what a mom always teach her children. Well, as adults there are times we should say or send unexpected thank you notes. Today, I will show you how I create simple thank you note cards using various scraps left over from previous projects. To get started, gather all items you think you may want to incorporate on your card. This includes your adhesives. 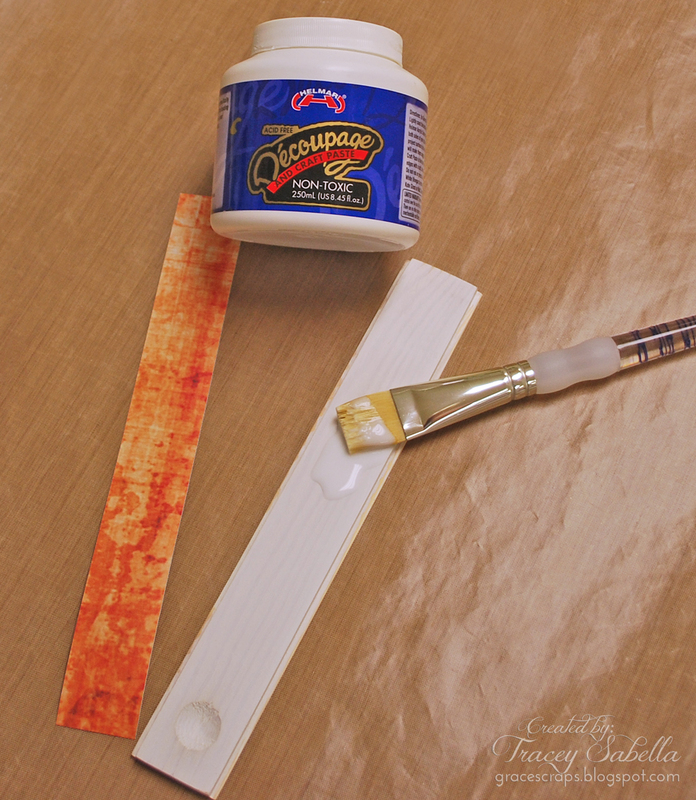 Using your Helmar Tacky Craft Glue , start layering your strips of patterned paper. Next for further embellishments, add more tacky glue adhesive to each of your desired chipboard . As you see here I've added my adhesive to the corragated side of a coffee sleeve. This adhesive will hold the piece of cheese cloth I eventually added. Next, I added Zapdots Clear Square 1/2" to the back of the corragated paper (which happens to be a Starbucks coffee sleeve). This will give the piece a bit of a lift off the note card, which will add a touch of dimension. And her's the final result of the card. Two beautiful cards awaiting to be sent to two beautiful souls. I make a lot of birthday presents that I give out by hand and I make all of the cards I give out as well. I know a lot of people who have birthdays in August, including my Mom, Dad and Sister who all have birthdays within 1 week. So, since it's the time of year that I give out a lot of birthday cards, I created these 2 matching cards as well as some fun, embellished gift wrap using my favorite Helmar adhesives! I used the awesome Helmar Liquid Scrap Dots to give my cards dimension! I applied a dot of the adhesive onto the back of my vintage die cuts and then lightly mashed them down onto the front of my cards so that they're adhered. I adhered my paper layers together using the Helmar Quick Fix Adhesive Runner and I used some Helmar 450 Quick Dry adhesive to adhere my transparencies. To make my embellished gift wrap, I used some of the Decoupage & Craft Paste to decoupage the sequins down onto my tissue paper. If you're just securing a couple of sequins, the 450 Quick Dry works great for that! I like to keep my small beads and jewelry findings in little jars and bottles and I like to see what's inside them, I also like to decorate things, so the best way to have everything I want is to decorate the lids. Following the current trend of decorating buttons that is going through youtube, I decided to use buttons as my focal point. Small jar or bottle (glass or plastic), buttons, mesh bling (or similar, like lace or ribbon), pearls, crystals, beads and glitter, scissors, flowers, off-cuts of lace and Helmar 450 Quickdry Adhesive. Firstly, cut a strip of mesh bling (or take your ribbon/lace) and adhere it to the side of the lid and set aside to dry completely. Next, take your button and cover it with a generous layer of Helmar 450 Quickdry Adhesive and add your embellishments of choice, as little or as many as you like. Once you are happy with the look, place your button into a small container and quickly sprinkle with glitter so that it sticks to any remaining glue on the button. Take your jar/lid that you set aside earlier and apply Helmar 450 Quickdry Adhesive to the top and place a scrap of lace on it that is just slightly larger than the lid. Apply glue to the underside of your embellished button and place on top of the lace on the lid. And there you have it, lovely decorated bottles/jars that take only minutes to create!! Hi Helmar fans! Cathy hosting the blog today and I have an easy and quick idea for making baby headbands. We are expecting our first grandbaby in September and you guessed it, it's a girl. We are beyond excited and I can't wait to dress her in all kinds of cute outfits and coordinating headbands. So many of these little headbands don't look very comfy for the little one and I came across a great Pin on Pinterest that had a great tutorial with upcycled baby headbands. Super soft and super comfy. You can find the link here. I knew these would be perfect with Helmar's Fabric Glue! First start with a pair of baby pants, these are 0-3 months. I picked them up at the local thrift shop for 25 cents. Pretty good deal for a headband! Cut the elastic band off of the pants either using a rotary cutter or scissors. Next, cut two strips of fabric from the pants, approximately 1 inch wide. Tie a knot at the end of one of the pieces. Start twisting and gluing with Helmar's Fabric glue as you go. Keep twisting and gluing til you have the size of rolled flower that you want. I added the second piece of fabric from the pants to achieve the look and size that I wanted. Once you have the rolled flower done simply glue it to the elastic band. I did sew on a button and added a bit of glue to it also, just wanted to make sure that it was super secure. Here you can see it on my adorable model Stella, since our baby girl isn't here yet, she had to step in and do some modeling! Here's another that I made. I love this one! I am going to try one with denim too. Soon, I will have enough for every outfit she has...lol! Thanks for joining us today at Helmar. My grandma gave me some photos that she found and thought I would like them. I love seeing photos from our family, especially of those that are no longer with us. I picked up this 7Gypsies round shadow box and thought it would be perfect to display the photos. Let's face it, they don't do any good setting in a drawer! Put out those photos for everyone to cherish! I have used Helmar 450, zapdots and scrapdots to add some dimension. I made a circle template that I used to put over my photos. I then cut them out with scissors. The only "journaling" I did was to add the last name of the family members and the years the photos were taken. I also distressed the wooden shadow box a little bit as well to make it look older. I would love to see how you display your family photos! Hi everyone, Sandee here with a little home decor item today to share today. It's a small vanity tissue holder that has been mine since I was a little girl. It was a tad dented so I covered the blemish up with a flower and a sentiment and now I am loving it all over again. It was very easy to do because I had the best glue doing all the work for me! I used my Helmars' 450 Quick Dry Adhesive to adhere the leaves and the flower to the metal base. It holds so fast that I could keep working on it as it dried. My next step was adding a flexuous banner with the sentiment Bless you. I wanted to make sure that the wave in the banner remains firm, so a dollop of Helmars' Liquid Scrap Dots assures that it stays rippled. This part does take a little more curing time, but the effect is so worth the extra waiting time. So there you have it, a super easy little remake of an old treasured object. Did you know that virtually every country around the globe has its own way of wishing sneezers well? Hindus say, "Live!" or "Live well! In Russia they respond with "bud zdorov" ("be healthy") and in China, he or she will hear "bai sui," which means, "may you live 100 years." And of course most know the German "Gesundheit" for (good health). I've become obsessed with book paper decor and crafts. I'm not sure why, but I just love the idea of taking something old and discarded to create a piece of art. Recently I found a lot of images and ideas I liked on Pinterest and began a book paper pin board - Book Paper. Who knew there were so many ways to use old books?! One image that really caught my eye was a paper wreath. I decided to try to make my own to hang as a focal point on my bedroom wall. I used an old dictionary picked up at a local thrift store along with a 12 inch cardboard circle, and Helmar Craft Glue. I cut each of the pages in half and then rolled each of these diagonally. With a little dab of glue on the corner to secure. Flatten each cone slightly at the smaller end. Do this many, many times until you have enough to fit around your cardboard circle base. Attach cones to the cardboard with more Helmar Craft Glue. Overlap the cones slightly as you glue them around the base. Once the first layer is done start on the inner circle placing each cone in between two from the previous row. I then spiral cut circles from more dictionary paper and made paper roses to fill the middle. As a finishing touch I added a little bit of gold rubons to the edges of the flowers and topped it off with a chipboard word that I had painted gold. All attached with Helmar 450 Quick Dry Adhesive. Here is another look at my finished wreath hanging on my wall. I have a few more book paper projects I've been working on and I'm excited to start a few more. They are going to look great as more decor around my bedroom. Hi eveyone Monica here today sharing an altered house. I found this small house as I was shopping in Hobby Lobby and i picked up a couple of them to alter. Sometimes I have people ask me how do I choose items to alter.. well I look for pieces that I can take apart and easily put back together. Items that have small intricate pieces I clearly stay away from because once I am done taking it apart - I look down and see so many small piece that I have no clue how to put back together. So in the trash it goes lol. So here we go my altered house well actually its a Bird House. I applied Helmar liquid Scrap Dots to the back of the chipboard window to give it height and this has got to be the niftiest glue I have ever seen. It does the exact same as the foam tapes type of adhesive but what is nicer is that you can put it in places you couldnt with the tape due to the shape. Then I adhered the paper to the house with Helmar Tacky Craft. Here you can see how it does the exact same thing as foam tape does!! I made some flowers and placed it along the backside of the house next to a birdhouse resin piece from Prima. Front look at the backside of the house with the flowers. I hope everyone enjoyed my post and thanks so much for stopping by. Hi! It's Tracey here to share a special off the page project destined to be a gift for our daughter who collects fountain pens. It's just right to hold one of her prized possessions. 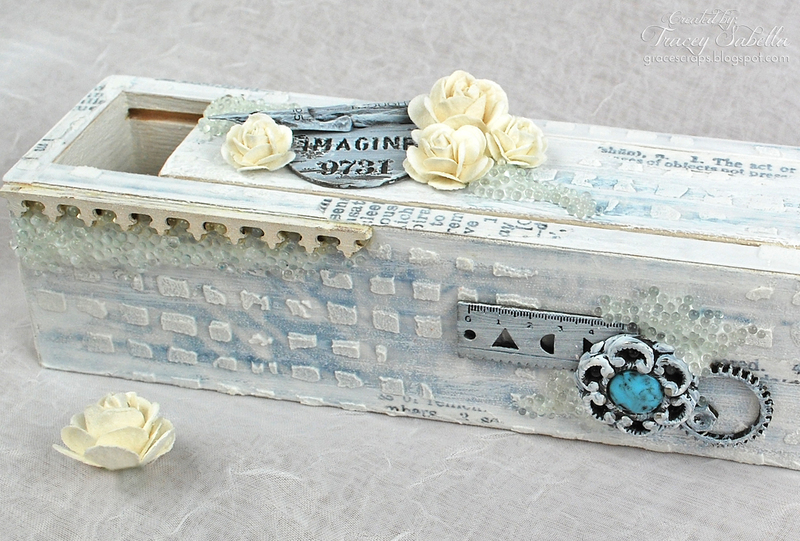 Helmar has a wide variety of products, and today I'm showcasing the Decoupage and Craft Paste, which I used to adhere and coat the paper on this sweet pencil box. I purchased this unfinished wood pencil box at my local craft store. The first thing I did was to brush it with gesso. While the gesso was drying, I cut pieces of paper to fit the sides, top, and sliding piece. **Note** Do not paint the edges where the edges of the closure piece slide into place. To adhere the paper to my box, I generously coated the wood piece to be covered as shown here, and the back of the paper with Helmar Decoupage and Craft Paste. I then placed the paper over the coated wood. A wide, flat brush as shown in the photo will help apply the Decoupage and Craft Paste with just a few strokes, so it is nice and wet for the application. You will have a few moments before the glue sets to move the paper around to center just right over the wood piece. 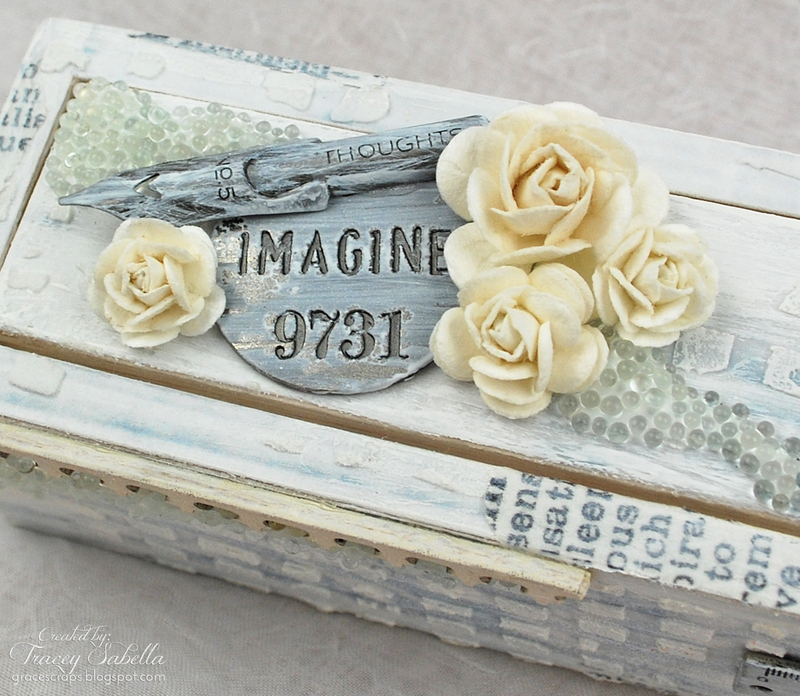 Helmar Decoupage and Craft Paste over the entire box to seal. When dry, I randomly stenciled molding paste here and there on the box and tore bits and pieces of dictionary script tissue tape to apply around the box, then dry brushed the entire box with watered down gesso. The metal pieces were also dry brushed with gesso before applying to the box with Helmar 450 Quick Dry Adhesive. I adhered a small piece from a drawer pull to grasp to open and close the box. To make sure it was securely in place, I used Helmar 450 Quick Dry Adheseive, which gives a very strong bond. 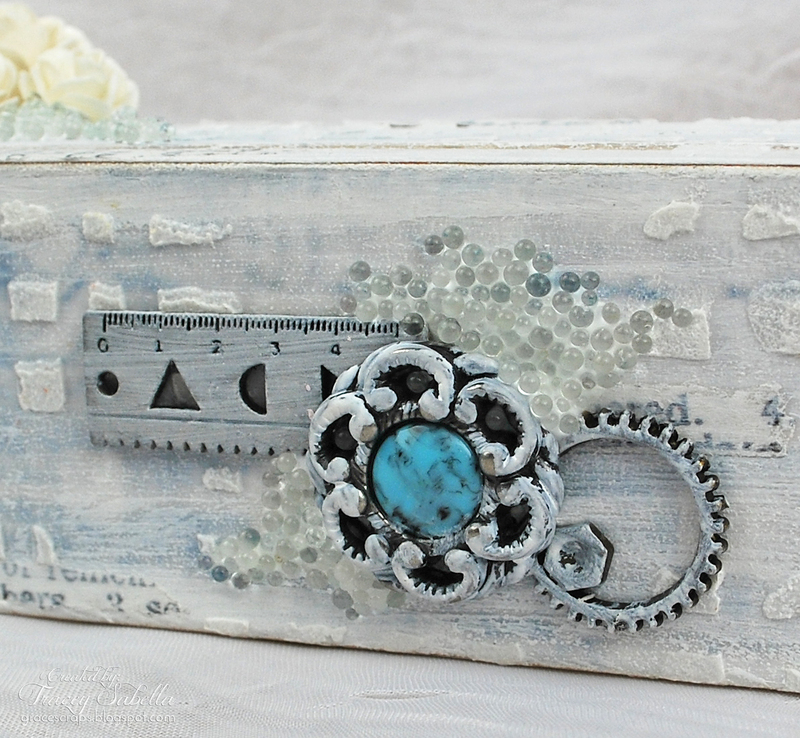 I added metal decor pieces to the side of the box using more Helmar 450 Quick Dry Adhesive. To adhere the button, which was raised off of the box by the ruler and gear, I used Helmar Liquid Scrap Dots, which spanned the open space below the button to adhere. I've been into using glass mini marbles and microbeads lately, so I tried something new here. I wanted to cluster some of the beads around my other embellishments, so I squeezed on a nice thick application of Helmar Craft and Hobby PVA Glue. Then I sprinkled the glue with glass mini marbles. I adore the extra dimension and how the light reflects off of them. This glue dries crystal clear, so when dry, all you see is the cluster of marbles. Here's one final shot to show how the box looks as it is being opened. Hello everyone it's Jeanette here again and lately I've been going mad decoupaging literally everything that doesn't move on my craft desk!! I've been using old dictionary pages as my paper and it's been working wonderfully with Helmar Decoupage and Craft Paste. Then I came to my dolly pegs and the book paper wasn't going to be as straightforward as a box so I decided to use my trusty paper napkins instead and thought I would share the proces with you. You will need dolly pegs, paper napkins a brush and Helmar Decoupage and Craft Paste. Once the peg is completely covered, gently roll it along your paper napkin (using only one layer of the napkin) trying to make the join where the gap in the peg is. Allow to dry off just briefly (a few minutes) and then trim the napkin around the peg. Secure all the edges and cut through the paper where the slit of the peg is and trim. Once the peg is completely dry, apply another coat of Helmar Decoupage and Craft Paste. This should dry pretty quickly if you stand it on an old packaging box or you could use your heat gun for a quicker finish. And that's it!!! Fun little dolly pegs that actually take less than 5 minutes to make and once they are dry they are ready to hold your lace, ribbon or use in any project you like. Thank you for stopping by today and I hope you will give Helmar Decoupage and Craft Paste a try, it dries to a lovely matte finish and is wonderful to use.